All you need for this basketball math game is what you already have - a trash can and some paper. The trash can is the hoop and the ball is a crumbled up piece of paper. Ask one of your students to "make the ball" for you, they will be more than happy to do so. Make a couple to save time. Students are to earn shots in the basketball math game. How a shot is earned can be determined by each individual teacher. Most likely the teacher will put a problem on the board. If the student (or team) gets that problem correct, then they are awarded one shot. You will need to create a foul line on the floor so that every student is shooting from the same spot. The easiest way to do this is just to put a piece of masking tape down. After the students have earned shots, let them come to the foul line and see if they can make them. The students will have a blast! The basketball math game can be done in many different variations. Each student can play for him or herself. All shots will be earned and taken by the individual student. Otherwise, the game will be played in teams. You can make as many teams as you like, but usually 2 or 4 works best. When you play in teams, you must be fair in deciding who shoots. Does each member on the team need to correctly answer the problem to earn one team shot? Does each team member earn a shot when they get their problem correct? Each teacher will have to sort out these details on his own. enjoy the excitement of the 3 point line. Experiment with different variations and see what your class likes the best. 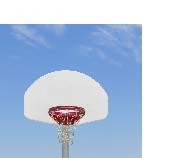 Return to other cool math games or reread the rules for basketball math. You may also like our free printable math worksheets.